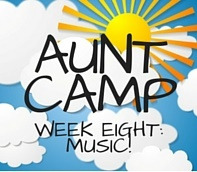 This week, teach them about music. It is a gift that keeps on giving. They can learn about different cultures, expand their minds, and help them express themselves while having a blast! 1. Have a parade: Grab anything that makes noise and dance to whatever beat they make. Bring kazoos, maracas, and drums. Make noisemakers by filling toilet paper rolls with dried beans or rice. Turn boxes, pots, and pans into drum sets. 2. Find their instrument: Music lessons are one of the best gifts you can give. Playing an instrument as a child not only fosters a love of music, but it also is incredibly good for growing brains. Students who play instruments receive better math scores, have a better memory, and improved reading comprehension skills. Playing an instrument completely rewires the brain in a way that will help your niece or nephew for years to come. 3. Take them to a concert: Your niece or nephew will remember their first concert for forever. You can take them to see a star they know or just head to your community center or park and see what is playing. Encourage them to dance and sing if that is the mood. 4. Make up a song: Help your nieces and nephews write a new song to add to their repertoire. Ask them about what makes them happy or sad and turn it into music. After you find something to write about, brainstorm words, rhymes, or phrases with your nieces and nephews and make up a melody. You can record it on Garage Band, on a microphone app on your phone, or a video and put it on Youtube to share with the rest of the family. 5. Show them different genres: Have a mini music lesson. Find a song from every genre and teach them about where each came from. Show them the dances that people do for each. This is a great way to teach them about different cultures and to be open to new things.